It's been awhile since I've written, honey. A little while ago, one of my readers reminded me that I needed to get back to this, because what if you are actually reading this blog? And ... well, let's just lay it all out up front here ... I'm not a person who is able to present a false front, even when it's the right thing to do, and with you above all people I want to be honest. So just remember that I love you above all things, and nothing is ever, ever going to change that fact. But I think I have been lax in writing because honestly, I still find it hard to believe that you would be out there reading my words and not responding. It's not even because I am so convinced that I am such a wonderful person and a wonderful mother that you could not resist running back into my arms (although I do believe that, because I know the strength of the bond between us and find it hard to believe that it could have been broken), but it is that every single moment of this not knowing, every single moment of this missing you, is a moment spent swimming in a sea of grief. And in this sea of grief, it is sometimes difficult to keep myself afloat, much less hold up that heavy burden of hope. I function, in some areas very well, and in some areas at less than par, but in all honesty, I live in a state of depression that wavers between a mild background state and a heavy, soggy-hearted state. But bear with me here. I have to say the things I have to say, but it will not all be dismal. Everything has been very, very close lately. I'm sure it is because the anniversary is approaching again, but there have been a confluence of other things happening that have brought various things back, right into my face. So let's start with the worst. I was watching the pilot of a new television show the other day -- "Grimm," it's called. I liked the show, liked looking at the pretty actor starring in it, liked some of the music, maybe the concept or maybe not, but we shall see. But it was about people who transformed into the Big Bad Wolf and kidnapped and murdered girls/young women. In the beginning there was a young woman grabbed while she was jogging. She then went off screen, but you could hear her screaming. And it just stabbed right into my heart, Michaela. I have never known what happened to you. It can't help but be that possibilities scutter across my consciousness from time to time. I try not to linger on them ... but I can tell you that I didn't find Jaycee's book as horrific as some may have. The things she described are actually far more pleasant than some of the things that have traveled down that dark path in my mind. People watch horror movies, read news stories, and to them they are just stories, but not inoften when I hear or see those things, my thoughts wander to you, my little girl, and to just what you might have endured through the years. If you are reading this blog, Michaela, then one thing would be true, and that is that however terrible the things you endured may have been, the very worst of the worst of those things did not happen to you. Do you know how very much I would like to know that? Do you know how much of a blessing it would be if you could just forever close the gate that allows those thoughts to travel through my mind in this way? I guess the bottom line is this ... I know you loved me. At the time you were kidnapped, I knew that in addition to the fear and grief you would be experiencing yourself, I knew that you would be worried about me as well, that you would be concerned about the fear and grief I would be feeling as well. 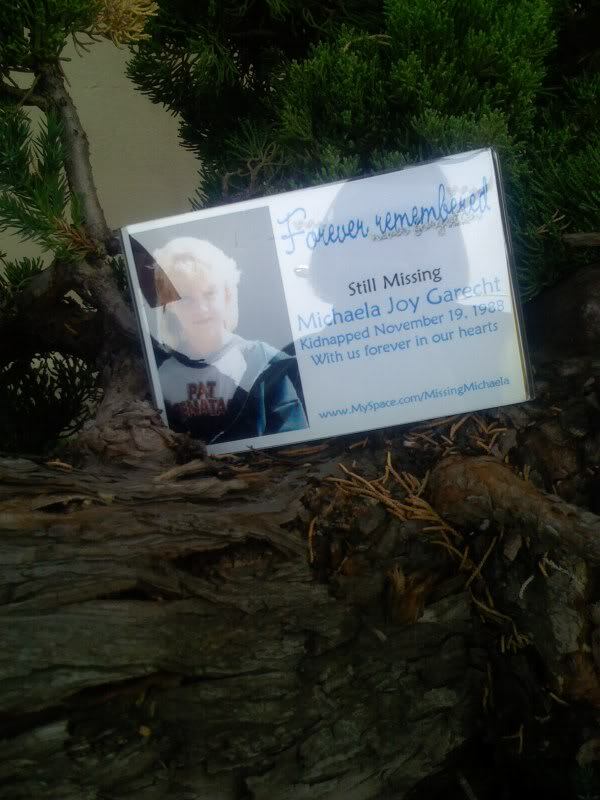 Michaela, if you are out there, even if you don't want to come home for whatever reason, if you could please, please, please just set this one small part of my mind at ease, could you do it, please? You can leave quite an anonymous comment on this blog if you want. You could e-mail me at missingmichaela@gmail.com. I will post my personal phone number in the side column of this blog in a minute. Just give me some information that nobody else could know, so that I know that it's you. Do you remember our family code word? That would work. Is there any memory of our life together that you could share that nobody else would know? Please, Michaela, I'm begging you, on my knees, with my heart full of tears. Please. Try to love the questions themselves, like locked rooms, and like books written in a foreign language. Do not look now for the answers. They cannot now be given to you because you could not live them. It is a question of experiencing everything. At present you need to live the questions. Perhaps you will gradually, without even noticing it, find yourself experiencing the answers, some distant day. That distant day has come. It is here. It is time to start living the answers. As you held my hand, Michaela, when you took your first steps (and how clearly I can see and feel that, deep in my heart), please just take my hand now, and together we will take those first steps into the light of the truth, and the warmth of the love that binds our hearts together, now and forever, for all the past and for all the future. This is a very touching blog. I commend you for having the courage to share with us your inner most feelings. If I had, had your experience I don't think I'd have the guts to share my feelings so openly on a blog for the world to see. I read your post that you discontinued the number you had set up for Michaela due to financial reasons. I wanted to let you know if you need a number temporarily, check out a place called evoice.com. Here you can pick either a toll free number or a local number. Either one you pick is FREE for the first for the 1st 6 months, after that regardless of you picking a toll free or local number the price is only $9 a month. You also get free caller id, call waiting, an auto attended, callers can listen to music while on hold, Voicemail. You can also have the calls automatically forwarded to your cell phone or any landline number for free! Also I don't know if they have K-Mart where you live. They carry prepaid cell phones. I realize many store have prepaid cell phones. However Kmart had ones through AT&T. The basic cell phone is around $20. Unlike most prepaid cell phones these through K-Mart allow you to get free nights & weekends and X number of daytime mins the basic 'plan' starts at a little under $20 a month. Once again its a prepaid cell phone so if you need to cancel it you won't actually be breaking a contract. Thanks, Ellen. I might look into that evoice. It would always be good to have a number for the general public to call where I would be sure to get the messages. But I also want to be able to have a number for emergencies ... like if Michaela is actually out there and wants to call. Or the advocate is another perfect example, because she apparently made contact with a single use cell phone which couldn't be traced. But for those emergency calls, the only thing that is really going to work is my regular cell phone, because that is the only thing that is always with me and always charged. So I'll just have to trust that it will be used as it's supposed to be used. The thing is that I work, and while I'd interrupt a consultation with a client to take a call from Michaela, I can't really be doing that to take calls of sympathy, or to take leads from people who say they knew someone who looked like the kidnapper ten years ago. Same with my off-work time when I am rarely doing nothing. I am really, really good about answering comments and e-mails though. Even if I say nothing besides "thank you," I always, always answer, because I really do appreciate all those people who remember Michaela and who take time out of their lives to tell me. In fact, if I haven't answered, or at least "liked" a comment on facebook, you can be sure that I didn't see it. One of the wonderful things about evoice, should you elect to use it, regardless of you using it for the general public or a number just for Michaela. You can set up so all calls go directly to your charged cell phone that is always with you! This way if in the future you elect to NOT give out your personal numbers you have a number to give out that allows the person to call you directly & you can answer the call or not from your cell phone. The “Advocate.” I don’t know what was said between that person & you & your investigators, and frankly it doesn’t concern me & trust me I am NOT asking for details. I do remember reading your post about it. Frankly, I was disgusted & turned off by it. It was some of the things you said & many things your ‘followers’ left as comments that I was repelled by. Maybe this “Advocate” is a “crackpot” who sadly was finding some kind of sick enjoyment out of “toying” with the mother of a missing child. However it IS a possibility this person was NOT doing this and honestly doing their plain vanilla civic duty by calling whoever it is they called! Frankly who the heck cares the call came from an untraceable phone! Would you have rather them NOT called from a traceable phone? As a mother unless I knew 100% beyond a shadow of a doubt, “The Advocate” was a “crackpot” I would NEVER share such a negative post with as much information as you shared about what happen with this said “Advocate.” If there was a 1% chance this person held the key to my missing child & unlocking what happen. I would not be sharing the information on my blog in such a manner my followers would hold a witch hunt in honor of the “Advocate”! As a court appointed court reporter had I been the Advocate who called, (Just so we are crystal clear I am NOT the one who called.) If I saw the things YOU POSTED regarding this matter along with the snotty & crud comments YOUR followers said. There is no way in HELL I would call you or your investigators back let alone HELP YOU! Electing not to help you after what you posted, would be because of YOUR actions with that post NOT because I had something to do with the said child being kidnapped! As a mother IF this “Advocate’ held the answer(s) to my 23 year long NIGHTMARE, I would literally kill myself if I risked them helping me by my own negative post about what happen followed by all the negative comments by my followers! Wow, Ellen. Well, that was pretty scathing, but I'm still here talking. I can't really remember exactly what I said in those posts, but I can tell you that I was not trying to reach out to the Advocate. If Michaela was actually out there, I was trying to reach out to her, and to help her to break free from the influence of the Advocate, who seemed bent on controlling her. Just so you know, I really do not think this Advocate was someone trying to get her jollies. You'd be surprised, but we've had several people who thought they might know Michaela or even might be Michaela, and they were all very sincere in their beliefs, and my feeling was that this was true with the Advocate as well. However, she never presented any proof. And just so you know, the brief contact with the Advocate had ended completely long before I wrote anything about it. I do NOT write about ANYTHING that is currently being investigated. Obviously I am perfectly happy to take information from completely anonymous sources. If I wasn't, I wouldn't keep suggesting ways to do that. I used the example of the Advocate because she called in a way that was not able to be traced, as an encouragement to anybody, including Michaela, who wants to call and wants to be anonymous. However, the key word is INFORMATION. So you are a court reporter. I'm a paralegal myself. I know you will think I'm a terrible person for saying this, but I can't help it. Anybody who has information about Michaela and just calls and says, "I know but I'm not telling" is not doing their civic duty, vanilla or otherwise. However, it is never too late for them to redeem themselves. Sharon, what's the status on the fund you'd mentioned some time back? That's on hold, but the good news is that our police department is examining some plans that will allow them to focus more fully on fully tracking the leads that need to be run down on Michaela's case. I am really hopeful. Was Curtis Dean Anderson ever investigated? I recently saw a show on ABCnews about the kidnapping of Midsi Sanchez and her escape. He drove an older model 1983 tan american 4 door car that had damage.. Yes, he was investigated. He also made some deathbed confessions and was asked at that time about Michaela, but denied any knowledge in her case. I'm just blown away that a person would be ignorant enough to think you would do anything to put Michaela in danger. I worked just down the street at the time, where Curtis dean got arrested. I drove past a lot of police cars going home from work, and had no clue what was going on. That poor little girl was so brave to keep her head after what she endured. I truly pray everyday that this case is solved and she is brought home to you safe. I hope the people who write these stupid comments can come to realize the error of their ways. Thanks, Rod. And you are right about Midsi Sanchez, of course. She saved not only herself, but who knows how many other little girls who might have fallen victim to Curtis Dean Anderson in the future? As far as Ellen goes, who wrote that scathing comment above, she definitely could have expressed the same opinion in a much nicer way. It really didn't need all the capital letters and really terrible adjectives. It actually bothered me quite a lot, more than it should have I'm sure. I guess the funny thing is that, while I haven't gone back to read what was said about the Advocate, I'm sure it wasn't any meaner than what she said in this comment. And quite honestly, if your child had been missing for 23 years and someone dared to come along and say that they were "taking care of her" and advising her that it was not in her best interest to go home, you would be absolutely furious as well. This also happened right after the Jaycee thing, at one of the very lowest, most difficult times of my life, when I barely had the emotional resources to keep putting one foot in front of the other every day. So really, the vitriol in that comment was uncalled for and really not okay with me. Thank you Sharon for responding to my question about Curtis Dean Anderson. When Midsi Sanchez was describing his car, the first thought that popped in my mind was Michaela. Then she described him telling her he stole muliple girls and boys and sold them. My heart just dropped!! :( I'm glad he was investigated and denied any involvement in your daughter's disappearence. He was a true monster. Peace to you Sharon and your family. May 2012 bring your sweet girl back into your life.